Thanks for your thoughtful feedback on part 1 of this note. The Lean ‘movement’ is indeed in flux, no? We need to reflect and adjust our activities in accord with the needs of our partners and communities. How to do this? In my view, we need to double-down on Lean principles. Otherwise, may I suggest that we are essentially a skilled trade – useful, honorable, worthy of study and practice – but not a game-changing, earth-shaking, get out of town transformation. 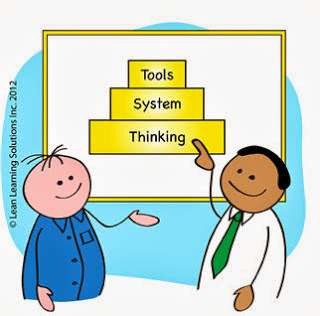 Lean – aka Toyota Production System, aka the ‘Profound System of Knowledge’ (Deming) – is a set of principles that turn into methods & tools appropriate to the situation. But many of us have become enamoured of our tools & methods, have we not? To be sure, Standardized Work, Jidoka, Heijunka and the like are splendid & powerful methods. But unless we understand & translate the underlying principles, our impact will be limited. Principles are ideas; methods are the action that bring them to life. Principles are eternal; methods, temporary. For example, principle like ‘Make Problems Visible’ and ‘Build Quality into the Process’ find expression in Toyota’s famous Andon board. If we focus on the Andon board, and not the underlying principles, how are we to help, say, a developer of financial security software? Or we might have come up Agile & its constituent methods (Scrum, Kanban etc. ), as our IT colleagues did a decade ago. Now ideas are harder to teach & apply than methods. Unlike methods, ideas cannot be turned into three-day, or five-day, or three-week ‘programs’. Ideas are not so easily monetized. But their impact is much greater, and the astute leader will notice the difference. Much of my personal practice entails coaching senior executives. I start with the principles, to get their interest, then provide examples of how the principles have been applied in different industries. If we deepen our understanding & application of Lean principles (thinking), we’ll be relevant & helpful for decades to come – and have a hell of a good time too.